Best Name Ever – We've Got The Best Business Names Ever! Best Name Ever is dedicated to helping start-ups find… you guessed it, the best name for a business, company or product. If we know anything about the business world today, a good business name is just not good enough anymore. Business owners need names that stand apart and get people to notice them. Getting the best name possible for your new venture is incredibly important and can make the difference between an OK start and “Bam” start to your business. Check out some of the creative and interesting names for a business and be sure to check out our tips for how to create them. You may find more than one “best name for your business” or even “best product” name for your new venture. When you’re coming up with your business name ideas, try all the different types of names then when it comes down to your final decision, figure which type of name works the best. You may find that a creative name is really interesting, and a descriptive name sounds perfect, also an invented name sounds great. Consider the effect of these names and types of names will have on your customers and pick the one that will bring them to you and get you that sale! Your target market should ALWAYS be in the consideration when you’re deciding which type of name and which final name you choose for your business or product. Check out the Best Tips for Naming Your Business Blog where our staff, who have been naming companies, business and product for many years, post tips and info on how to develop the best name for your business and we even point out some of the pit falls to avoid along the way. Our Best Name Ever Naming Staff will also be reviewing existing business names and we don’t take ourselves too seriously. We truly ask our readers to send in funny or humorous business names, names that grabbed their attention, the best and worst domain names and the best business or product names ever so we can say what works or doesn’t work about them. We’ll discuss what works and what doesn’t work about the business names, all in a effort to help you develop the best name for your business. We’re also a great sounding board for anyone who wants to know how others feel about their business name idea. We welcome people posting their potential business name, product name or company name and letting other people tell when what they feel about the name. We’ll also weigh in and give some suggestions of our own. This could be a great resource if you’re just unsure or have a fear that the name could be read in a different way or you’re looking for different perspectives. Try out Best Name Ever and we know you’ll find something you like! Best Name Ever doesn’t just have some of the best business names ever we have great tips for naming your business. Be sure to check out our Best Business Name Ever Tips and Info section. We also have area where you can submit your business name ideas and what you plan on doing with it and our readers can tell you have they feel about the name. 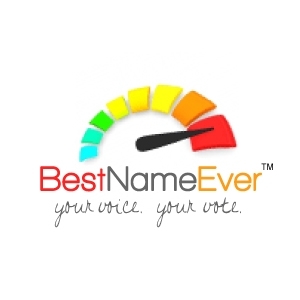 What a great way to find out how potential customers feel about your business name ideas.